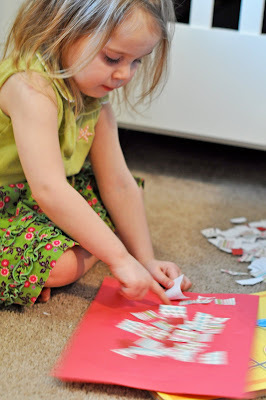 Then we took those pieces and glued them onto a piece of construction paper. Then I traced hearts onto the back of the construction paper we had just covered in the scrapbook paper and cut out those hearts. We took those hearts and glued them onto some white cards. I got out the modge podge to make sure everything stayed glued and put a little onto the top of the hearts/cards and let Abby paint that across.